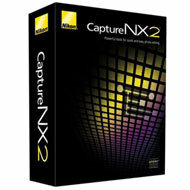 The previous rumors about a 64 bit support in Capture NX materialize today with the new version 2.3.0. Nikon also released ViewNX v2.2.5. Lens information is now displayed in the Metadata palette for images captured with the Nikon 1 V1 or Nikon 1 J1 using the Mount Adapter FT1 and a CPU lens. Support for images captured with the Nikon 1 V1 and Nikon 1 J1 using the Mount Adapter FT1 has been added. An Astro Noise Reduction option has been added to Noise Reduction in the Camera Settings portion of the Develop section in the Edit List palette. This option reduces the randomly spaced bright pixels that occur in images of stars captured with long exposures. An Auto2 option has been added to New WB under White Balance in the Camera Settings portion of the Develop section in the Edit List palette. This option is available with RAW images taken with the COOLPIX P7100. When white balance is changed to Auto2 and a settings file saved, a white balance setting of Recorded Value will be applied if the settings file is used on a RAW image that does not support the Auto2 white balance setting. When Set Gray Point was selected from White Balance in the Camera Settings portion of the Develop section in the Edit List palette, and the image clicked to specify a portion to use as the grey point, the point selected was sometimes not accurately reflected in the resulting white balance if the image had first been rotated. This issue has been resolved. This software now operates as a native 64-bit application under the 64-bit versions of Windows 7 and Windows Vista. An Embed Preview When Saving NEF/NRW item with Thumbnail and Preview and Thumbnail only options has been added to the General panel of the Preferences accessed from the Edit menu. In addition, preview images can later be added to NEF/NRW files saved without embedding them using the new Update Preview option in the Browser palette context menu and File menu. The default setting for the Use Image Cache option in the Cache Settings panel of the Preferences, accessed from the Edit menu, has been changed to off (not checked). When Capture NX 2 Ver. 2.3.0 is installed with the Use Image Cache option enabled (checked) with the previous version of Capture NX 2, Use Image Cache will be disabled (unchecked) and cached data will be deleted. An issue that resulted in inconsistent display of images in the Browser palette and images inside the folder selected in the Folders palette has been resolved. When a batch process was run for images captured with simultaneous RAW + JPEG recording by selecting Run Batch Process from the Batch menu with a new naming convention applied to the RAW and JPEG images, new files were not always created for the selected images. This issue has been resolved. An issue that caused the Folders, Browser, and Metadata palettes to be shifted down when Windows was set to display the taskbar at the top of the desktop has been resolved. When Set as Default Printer was applied to some printers with Windows, a Capture NX 2 stops working error message was displayed when Capture NX 2 was exited. This issue has been resolved. When tone curves were edited using Adjust menu>Light>Levels & Curves, Adjust menu>Color>LCH, or Quick Fix in the Develop section of the Edit List palette, positions of anchor points changed unexpectedly. This issue has been resolved. This software now operates as a native 64-bit application under Mac OS. An Embed Preview When Saving NEF/NRW item with Thumbnail and Preview and Thumbnail only options has been added to the General panel of the Preferences accessed from the Capture NX 2 menu. In addition, preview images can later be added to NEF/NRW files saved without embedding them using the new Update Preview option in the Browser palette context menu and File menu. The default setting for the Use Image Cache option in the Cache Settings panel of the Preferences, accessed from the Capture NX 2 menu, has been changed to off (not checked). When Capture NX 2 Ver. 2.3.0 is installed with the Use Image Cache option enabled (checked) with the previous version of Capture NX 2, Use Image Cache will be disabled (unchecked) and cached data will be deleted. When the selection brush was used to edit an image with the image window displayed at a large size (1980 × 1080, 1512 × 1008, etc. ), Capture NX 2 sometimes quit unexpected. This issue has been resolved. Auto 2 is now available for selection from the list of White Balance settings in the Adjustments palette for RAW images captured with the COOLPIX P7100. An issue that prevented display of Exposure mode in the Metadata palette for images captured underwater in Easy Auto mode with the COOLPIX AW100/AW100s has been resolved. An Event box has been added under Description in the Metadata palette. Support for Mac OS X version 10.7 has been added. An issue that prevented the editing of metadata, application of labels and/or ratings, or image rotation on some systems has been resolved.